The tower houses a ring of eight bells, the oldest is dated 1629 and was cast at the Doncaster bell foundry. The most recent, two further trebles were added in 1998/9 to celebrate the millennium. A framed document on the inside south wall of the tower gives details of each bell: weight, date, bell-founder, classification. 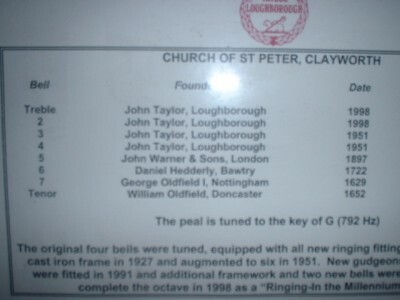 There are eight bells in the tower. The two smallest were cast by John Taylor of Loughborough in 1998. Bells 3 and 4 were cast by the same company in 1951. The fifth was cast in 1897 by John Warner and Sons, London. The sixth was cast by Daniel Hedderly of Bawtry in 1722. The seventh is by George Oldfield I of Nottingham from 1629. The tenor is by William Oldfield of Doncaster in 1652. Copyright ST PETER'S CHURCH, CLAYWORTH 2019©. All Rights Reserved.